Editors Note: Another guest contribution from R. Ann Parris to The Prepper Journal. As always, if you have information for Preppers that you would like to share and be entered into the Prepper Writing Contest with a chance to win one of three Amazon Gift Cards with the top prize being a $300 card to purchase your own prepping supplies, then enter today! I’ll leave the scavenging-vs-looting debate to others, and propose a situation where big chunks of humanity have died off, where fires and flooding rivers and sewage systems change where humanity is located and what legal services are in play, that we’re resupplying a community that has come together or expanded, or that we’re trying to make our way home through a landscape with few remaining residents. I’ll also specify abandoned locations, and leave the option of trading for supplies we find. Which resources most apply is situationally dependent. The type of disaster affects the timeframe and duration, number of souls, and affected area size. The number, mode of travel, and goals for the people searching for supplies also affects what’s useful. 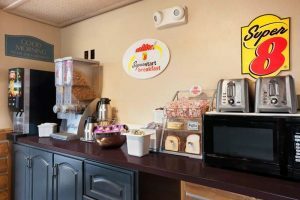 Even so, there are a few spots that can offer a lot of different resources for pretty much anyone, whether it’s short runs to a nearby area or a group or individual passing through totally unfamiliar territory. Gathering grid-down intel on resources in areas around us or that we’re passing is its own entire article, but keep an eye out for phone books in offices and libraries, and traveler’s maps and brochures from hotels, welcome centers, and law enforcement offices as you run around. They can not only give you ideas for resource locations that are less likely to be occupied or already stripped, but also give us places to avoid like an alligator farm, sewage treatment plant, and dense urban centers. There’s likely to be some locks to get around as we work through our locations. 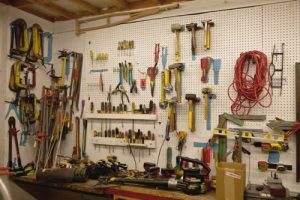 Many toolboxes can be defeated with a screwdriver or stiff, thin wire. 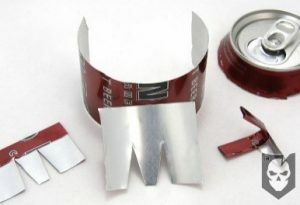 Some types of key and combination locks can be defeated with bent sections of soda cans – pieces from cans that can be cut with pretty much any ol’ dull, crappy pocket or kitchen paring knife or scissors. 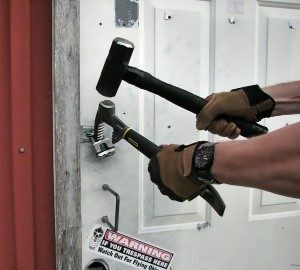 Most locks won’t stand against a crowbar smacked with a mallet. 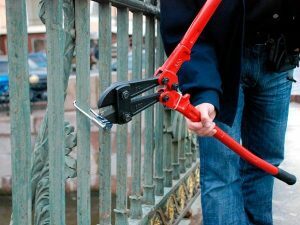 Two wrenches, a file, or a hacksaw blade take little space and weight, and can remove either a lock or the loop holding it. Mentality is also important. Most of our surroundings are pretty versatile. That spool of cable or wire is cordage, be it unwound to make shoelaces or stitch a duffle bag to a backpack frame, or used whole for a rope paddock. Lined blackout curtains, shower curtains, and hotel blankets that bead off water are a poncho or ground cover, too. A hot water heater has all kinds of options, to include being a source of water if it wasn’t emptied and rainwater catchment for a homestead. I’ll look at three options with a lot of offerings possible, but there are many other resource-rich locations out there that may be abandoned early or outlast additional disasters that strike during a crisis and wreck our well-laid plans. 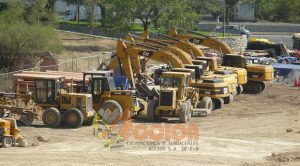 These – and the parent company sites and equipment rental shops – are rife with potential. There’s vehicles with heavy-duty batteries, diesel in vehicles with its longer-storing advantage, and periodically generators. The shipping containers on some sites have uses on their own, as do the hi-vis and chain link fencing that regularly enclose them. 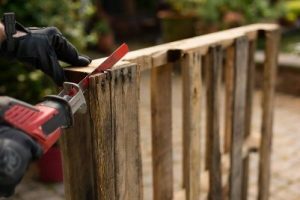 Depending on where they are in construction or renovation stages, sites can also be an excellent source for things like buckets, bottled drinks and water (or emptied bottles that can be filled), tarps or drop cloths with their many uses, heavy-duty contractor trash bags, gloves, hardhats, and caulk, paint or sealant. 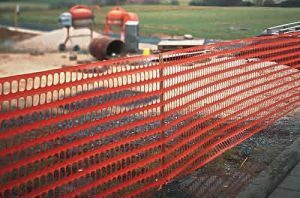 The raw materials on some sites can be handy, too, if we’ve been pushed out or unable to reach our supplies. 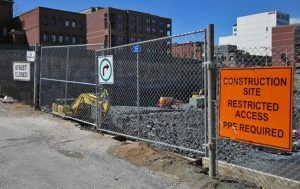 Many road construction and repair sites and some building construction sites use solar-powered caution signs. Those panels will be pretty darn handy if our energy preparations went down in a fire or flood or a community force decides to divvy everything up. First, let’s dispel a misconception. 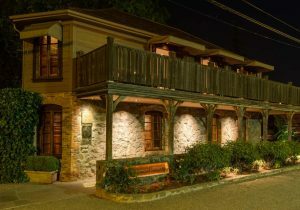 Most hotels – especially in the lower or midrange pricing levels – do not actually have emergency power. Some might have a generator somewhere on the property or an emergency power supply (battery) on their key card machine or computer, but many don’t. So if that’s on your checklist, throw it out. Hotels might be a risky move, just because they do offer housing for survivors who’ve been pushed out of homes. Everything in a disaster merits caution, but go ahead and weigh this one against exact scenarios. Hotels will also likely be full or will have already been stripped before evacuees move on in many disasters. Consumables like toilet paper, continental breakfast supplies, and coffee may already be gone. Some already have issues with theft from food and laundry vending, just like laundromats. 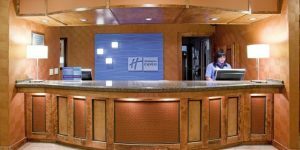 However, some of the major advantages of hotels barely get touched even in normal daily operation. I specified the lobby for a reason. 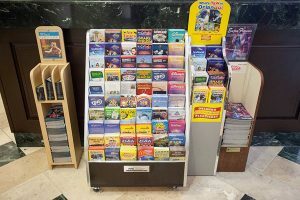 Somewhere near the front desk, you’ll find racks of brochures for area attractions – the same type you’d find at a welcome center off the highway. You also sometimes to regularly find little sale ad and coupon books for the local area, which can provide the same information as a phone book. And, hey, also a location where you can still find those phone books. 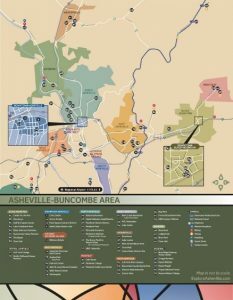 Check for city, county and region tourism maps, too. 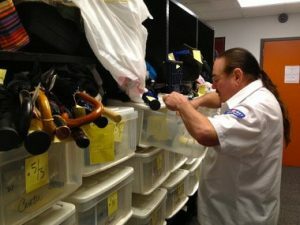 The receptionists usually have access to other goodies behind the counter and in back rooms. 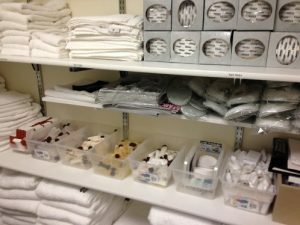 Some are the typical provided or by-request consumables like toothpaste, toilet paper, shampoo and conditioner, and soap. Depending on how busy it was before abandonment, those may still be there. 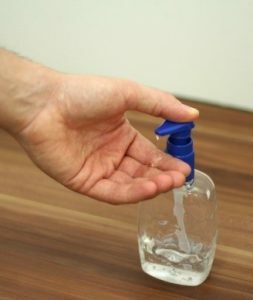 Most have some hand sanitizer right there (same holds true for gas stations – these people handle some grubby money that comes out of some brow-lifting locations). There’s probably a drawer or cabinet back there with some sort of wipe-down disinfectant, a flashlight, sometimes a few basic tools and some duct tape. They’re cleaning that desk area and the lobby/lounge and bathrooms. Those supplies are there somewhere, too, most usually, readily at hand without having to tag a housekeeper. 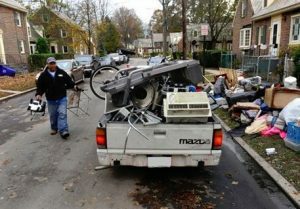 Also look for a lost and found locker, drawer or cabinet, or a laundry cart with bagged items piled up. People are grody, but they also sometimes leave useful stuff behind. Depending on the event, the rooms might still have supplies to offer, too. 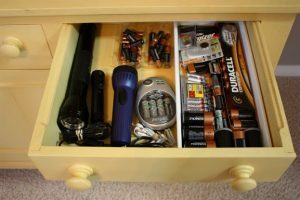 There may be light bulbs, batteries in the remotes, linens and blankets, mirrors, writing supplies, or other goodies. *By all means take the soap, in-room coffee supplies, and shampoo-conditioner from hotels in normal daily life. They’re accepted as daily-stay cost items and mostly aren’t supposed to stay for the next guest. 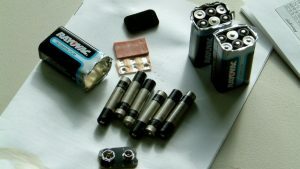 When you take batteries, rolls of toilet paper, boxes of Kleenex, light bulbs, towels, or pillows from the average low-to-mid-range hotel, you’re stealing and eventually it drives up the costs for everybody else because management now factors one in X rooms getting stripped into the average pricing. The same holds true when people help themselves to half the supplies in a human or animal examination room. 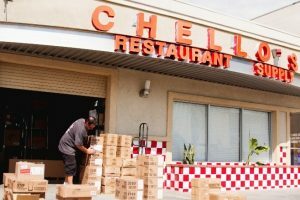 Restaurants may very well get emptied of foods pretty quickly. It already happens when snowstorms and hurricanes shut down shipping. 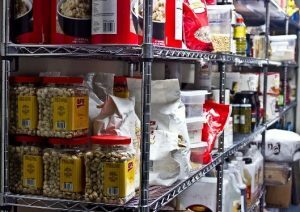 However, if an area was evacuated or the power went out quickly, restaurants may still have some pantry goods on their shelves. There may also be calories that were overlooked, even if others have already scavenged, and there’s heaps of other goodies. 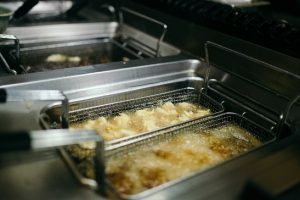 If we aim for restaurants that are heavy on fried foods, we may land both used and unopened oil. That can be turned into biofuel for diesels or used to boost the calories of lean squirrels and wild greens. Restaurants that primarily serve fresh bread, fresh toppings, and fresh or frozen meats don’t do much for us if we’re after food. We might be able to score some of the instant beans and rice or mashed potatoes from a Popeye’s, but a Wendy’s is likely to only yield salad dressing, ketchup and pickles. If we target one that serves great bunches of battered chicken, fried fish, and hushpuppies, there’s something else the first scavengers may not have been desperate or creative enough to snag: the breading/batter mixes. Remember, pretty much anything can be turned into bannock or ash cakes. Any of them may be sources for knives and sharpeners. Most will also have steam table trays and deep “bussing” tubs that can be used for growing, collecting water, wash stations, or preparing meals for bunches of people at a time. Higher-end restaurants may be able to provide us with more yet, such as candles, matches, lighters, propane torches, and table linens. 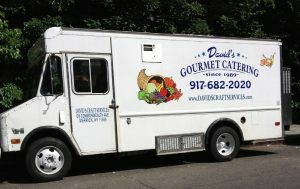 Along with restaurants, keep an eye out for signs and phone book listings for caterers and restaurant and catering supply outlets (and food service delivery trucks). Those are even more likely to have a wide variety of goods and they’re more likely to be overlooked as a food source by survivors. If you’ve left the compound on a scouting or scavenging run or are making your way with a backpack, there are some goodies you can find in almost any public place. 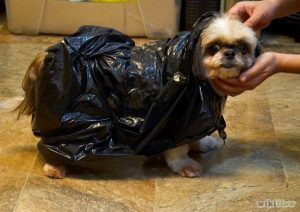 Trash bags are a biggie for any situation. 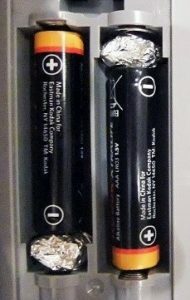 Someplace like a hotel or office usually has a variety of sizes and both opaque and clear bags. They can be used for water catchment, patching a shelter or a broken car window, solar stills, transporting water, or ponchos. 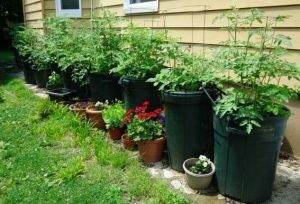 They can be used as weed exclusions in gardens, warming ground covers or for melting snow in the case of dark bags, cloches in cool climates, or even planting containers. Check for a storage, maintenance or cleaning locker/closet/room, too. They may still have supplies after a “front” space was scavenged, for everything from TP or paper towels, to snacks and copy paper. 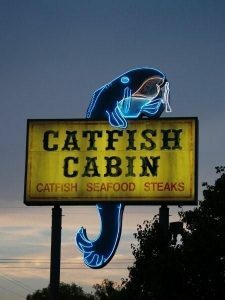 The same is true of gas stations. 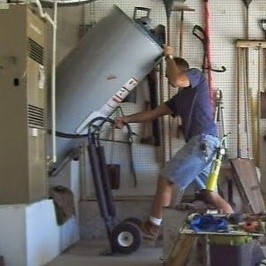 They’re also a good pick for hunting up a moving dolly if you need one while you’re scavenging. Buckets are super handy, and many public locations have some on hand in one form or another. 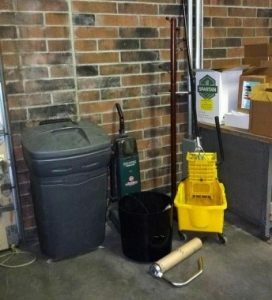 Many places have rolling mop buckets. 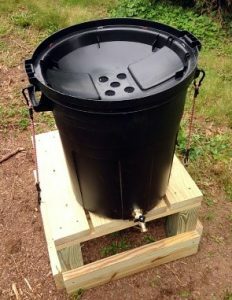 Trash cans of all sizes can serve the same water-catchment, water-hauling, feed-storage, and planting purposes as buckets. 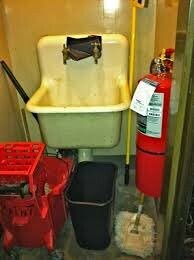 Most public facilities, even privately owned small businesses, are required to have certain things on hand, like first aid kits and fire extinguishers. Small business and hotel-room plumbing is going to be similar to typical residential toilets and sinks if we’re after parts. Larger-volume stops like malls, schools, and large McDonald’s restaurants are more likely to have specialty plumbing. Scissors are mighty handy goodies that can be found at the front desk or back office pretty much anywhere. There’s at least a small tool kit pretty much everywhere. 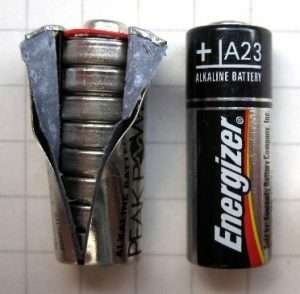 Smoke detectors – and their batteries – are another we might find right handy. Some of our habitual supply sources are in or past already dicey areas and many are likely to be picked over fast and early in a disaster. 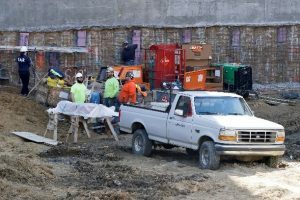 We can avoid exposure, congested areas, and wasted time scoping and clearing those locations by seeking alternatives. There are plenty of others that fall into the same less-obvious category, but these are pretty common, pretty easy to spot, and apply to both lone travelers and small to large groups. If we keep our minds open, even if we can’t get to our stored supplies, are out of our habitual stomping grounds, or end up part of a group/community that wasn’t well prepared, we can usually find what we need. The post Prime Locations for Post-Disaster Salvage appeared first on The Prepper Journal.